The above posted 3 coins represent the existing three different die combinations of 2009 5 Rupees from Hyderabad Mint. As we can see here, first two coins have similar obverse side (Lion bearing side) but they differ with respect to their reverse side (denomination bearing side). They differ with respect to font style used in the year "2009". Whereas third coin have a different lion with both obverse and reverse side having very poor relief as compared to first two coins. Please click and enlarge the picture to read the illustrative text. In order to commemorate the birth centenary of the freedom fighter Netaji Subhas Chandra Bose, Kolkata Mint released Two Rupees Commemorative coins in the year 1996 but Netaji's Birth date is 23 January 1897, which means that Kolkata Mint Commemorated his Birth Centenary on 99th Year, which is totally wrong. In order to correct this mistake Kolkata Mint stopped minting of 1996 commemorative issue and instead started minting the new commemorative issue on Netaji’s Birth Centenary bearing the date 1997. So we get 1997 dated two rupees of Netaji commemoration more easily than 1996 dated. Taking this advantage of rarity some mischievous people involved in altering the date 1997 to 1996 by just altering last digit "7" into "6". So the question is how to identify such altered coin and save ourselves from being cheated? There are two very easy way out for it, the first one is that, Always first look for the digit "6" and ensure that it is not a deformed or crudely shaped. The next question is what if the date is accurately doctored to match with 1996 issue? Then the final foolproof trick is to "LOOK FOR BORDERS". In case of 1996 issue borders are very thick whereas in case of 1997 issue borders are thin. Remember that, always look for border thickness where border is completely visible, don’t focus on shifted areas. Below given are the images, demonstrating the border difference. In the year 1985 Commemorative Cupro-Nickle 50 Paise coins were released from Bombay, Kolkata and Hyderabad Mint, in order to commemorate the golden jubilee of RBI (1935-1985). 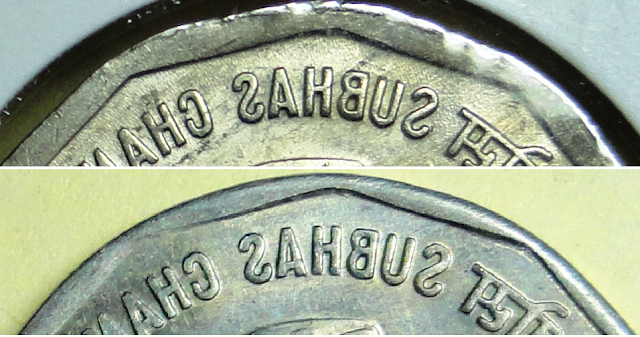 In case of Bombay minted coin recently I found this interesting error, which is commonly known as "Filled Die Error". This error occurs when the lubricant (generally, Grease) applied to the machinery parts of the die gets clogged into the actual die which is minting coin. In the above displayed pair of coins, Lion head on the left side is normal one and the one on the right side is the Greased head tip, where the grease gets clogged into the tip of the head (ear part) design as a result this part becomes filled with grease (hence called as Filled Die Error) and we will not get its impression on coin, leading to such errors.